Albumax is formulated for people who need a high quality protein supplement and who must limit their intake of other nutrients, vitamins and fluids. 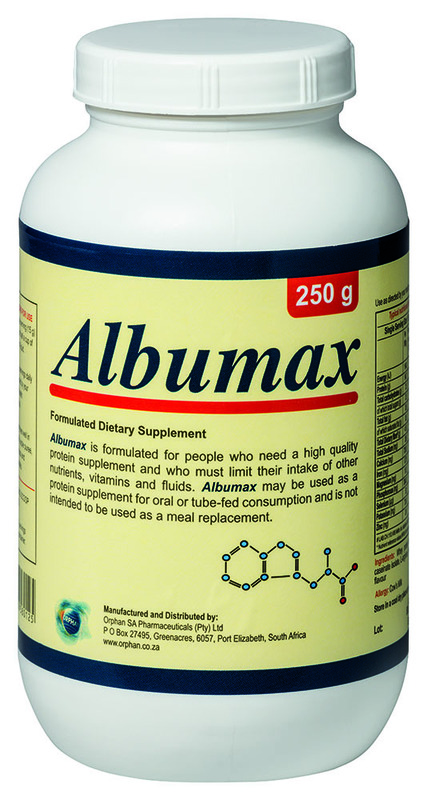 Albumax may be used as a protein supplement for oral or tube-fed consumption and is not intended to be used as a meal replacement. Dialysis patients need an easy way to increase high quality protein in their diet. Currently available nutritional supplements for dialysis patients contain a variety of ingredients some of which may not be suitable for individual dialysis patients. In addition many are formulated as a liquid which increases the fluid intake of the dialysis patient. Albumax supplies only high quality protein along with two essential amino acids in a powder form that may be mixed with or sprinkled on other foods. Preliminary results show that Albumax is very effective in raising blood albumin levels in the dialysis patient. Dieticians consulted about Albumax are enthusiastic about the product. Current nutritional supplements either are not designed specifically with the dialysis patient in mind or do not contain the amount of high quality whey protein isolate per dose that is in Albumax. Powder Form – no additional fluid intake for the patient. Mixes With A Variety Of Foods – patient can adhere to prescribed diet. Neutral Taste And Texture – will not alter taste of foods and beverages. Low Sodium, Phosphorus, And Potassium – no impact on prescribed diet. Contains Calcium Caseinate – a source of calcium and a protein that is digested over a prolonged period of time. Easy To Prescribe – each jar comes with a measuring scoop. Albumax contains calcium caseinate and whey protein isolate as protein sources. Most of the whey protein powders contain mostly whey protein concentrate with some whey protein isolate mixed in. Albumax contains only whey protein isolate. Whey protein Isolate is a better whey protein then the more common whey protein concentrate. Whey protein isolate undergoes a more stringent filtration process that yields a higher protein percentage and leaves out the fat, carbs, ash and moisture thus it is a purer protein with a higher biological value. It usually yields about +95% protein depending on the filtration process. Whey protein concentrate contains anywhere between 29% and 89% protein depending on the product. This is why Albumax has zero grams of fat and cholesterol. Calcium Caseinate is a biologically-unique grade of protein derived from milk, and is low in fat, lactose and sodium. In addition, Calcium Caseinate boasts an impressive nutritional profile that's naturally rich in amino acids, protein and calcium. Despite having the same high quality rating as traditional whey isolates, Calcium Caseinate is more slowly utilized based on its coagulating properties. This slow digestion process allows the body to absorb more of the amino acids and peptides, while offering a steady and prolonged supply of nitrogen to muscle tissues.